I'm going to be playing catch up on the blog this week. I've been super busy but loving every minute of it. In my last post, I mentioned that I have started two new business ventures. I am sure you are curious to what I've been up to. Well for one, I am now teaching violin. That's right, all those years of lessons and playing and I'm now giving back. I've taught A right from the start and she is really progressing. 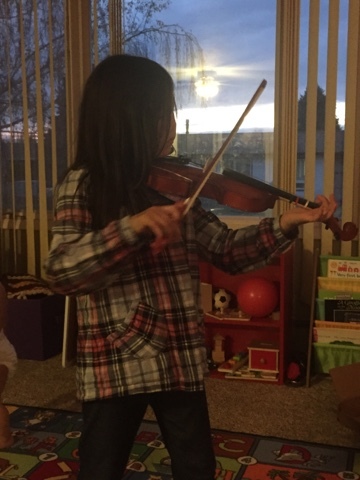 I have yet to live in a place where there is another violin teacher for her to take from, so it's been something I've done with her myself. 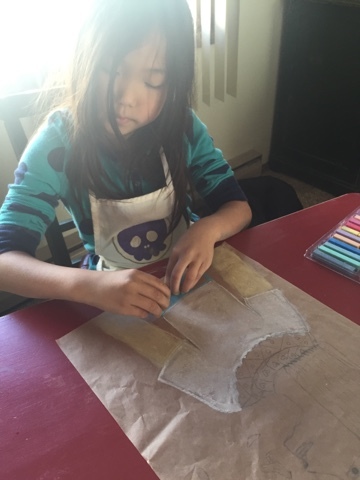 This summer, I was approached by a mother I met about giving her children lessons. Her son already played and had been traveling across the boarder for lessons but his teacher quit. At first I said no, but the more I thought about it, the more I decided "why not!" As of now I am teaching 5 students a week (not including my own sweet girl) with a 6th starting in December. It has been a lot of fun and I am really enjoying it! My second venture that I have taken on is one that is near and dear to my heart! BOOKS! That's right, I am now an independent consultant for Usborne Books and More! I have always loved their books and when the opportunity to join presented itself, well I jumped on it. 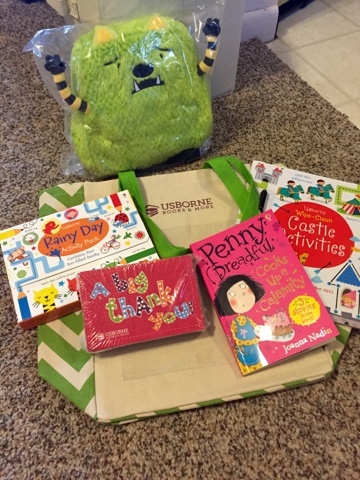 This is a picture of my second success story kit I recieved last week! You can check out these AMAZING books and more at my site https://m4070.myubam.com and be in the look out for some GREAT Black Friday and Cyber Monday deals. Of course all of this along with homeschooling a child with an unquenchable thirst for knowledge with busy toddler running around, means I am busier then I have ever been before! Tonight as I listen to the wind howling outside bringing back memories of my windswept island, I am looking back on the Egyptian Portrait project A worked on in October. 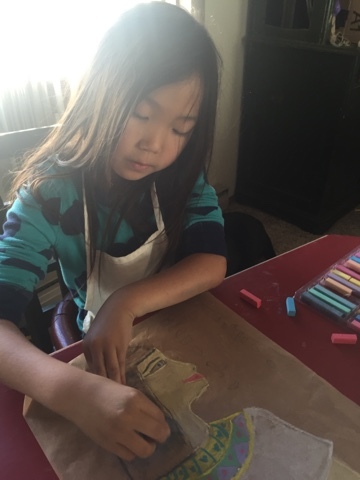 Our study of Ancient History of course took us through Egypt, and as westudied Egyptian art,we took note of the forward facing body with face turned in profile that is prevalent in much of the Egyptian art from this time period. 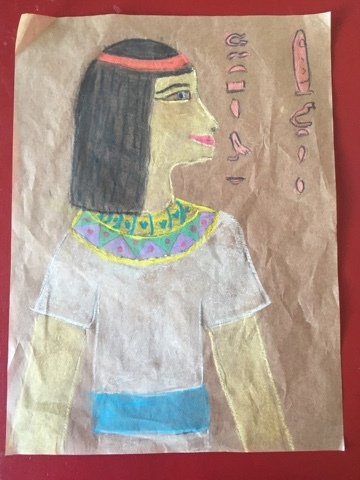 A spent one afternoon drawing a portrait in the Egyptian style on unbleached parchment paper. On a second day we pulled out the chalk pastels and I have gave an introduction on working with them. 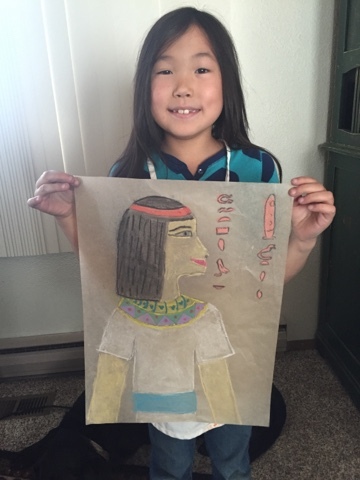 She spent the next few hours completing her Egyptian portrait. I love the holistic approach of educating. Involving not just the brain, but the heart and soul in learning is paramount. 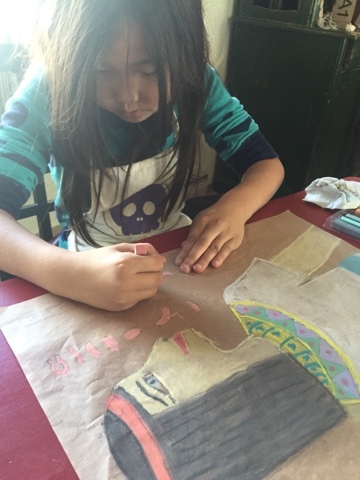 It really is the extras, the music and art, that creates a balanced and soulful education experience.Unfortunately, this is missing from so many schools today and it is one of the beauties I find in creating this homeschool life. Wow! The portrait is beautiful! I love the way you homeschool. It's so hard to find the right balance.